Inspiration for stories can come from anywhere; people we meet at the train station, snatches of overheard conversations, newspapers and just about everything else. I've been thinking about writing a story around a character I love in my upcoming series, The legends of Winatuke whose name is Pennytook. He's the chief of a Gypsy tribe in the world of Winatuke and travels from one fascinating place to another trading horses, going on adventurous quests, or enjoying the local frivolities. I happen to watch a television program on National Geographic and saw an episode of a series I believe is called Human Planet where they explore the customs and cultures of people who live in extreme places. 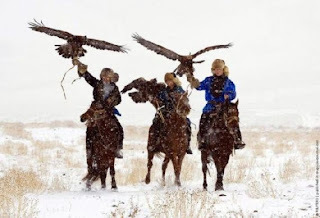 The episode that fascinated me the most was the Monguls who, as a right of passage into manhood, must scale a cliff, steal a Golden Eagle baby, raise it and train it to hunt. It's like the ultimate in falconry. When I saw how magnificent these people looked on their sturdy ponies, with their beautiful Eagles tethered to their arms, I knew, this was the image I wanted for my next hero, Pennytook the Gypsy. From where do you get your inspiration? What is the most inspiring thing you ever encountered? Did you write about it? Do you purposefully look for inspiration or keep a writer's journal? Tell me about it.